When you have a newborn to care for, you are usually exhausted and the thought of working out might be low on your list. But when you're ready, you can begin to get back into your pre-pregnancy shape. Don't be afraid to take it slow at first and don't be too hard on yourself -- it took nine months to put the weight on, so it's not going to fall off overnight. Women often complain of resistant lower belly fat post-birth; exercise will help you burn fat all over your body while toning the deepest layers of ab muscles, according to Parenting.com. You can do all the strengthening exercises in the world, but if you don't burn fat over your whole body you'll never see the fruits of your body-toning labor. Since time is usually a consideration for new moms, you'll want to do a cardio workout that burns the most calories in the least time. In a 45-minute workout, a 150-pound woman will burn 688 calories running 8 mph, 446 calories cycling 12 to 14 mph, 351 calories from spinning and 310 calories while swimming, per HealthStatus.com. 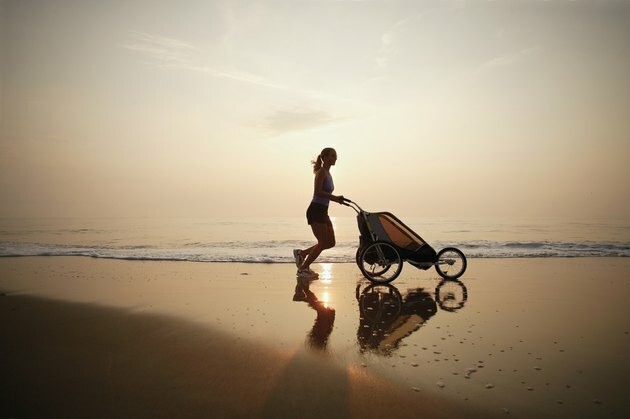 Another effective calorie burner that involves your new bundle of joy is a stroller workout. Just pushing the stroller at a leisurely pace for 45 minutes burns 135 calories; up the ante and run with a jogging stroller for 45 minutes and you can burn around 800 calories -- plus the baby gets an outing. Aim for three to five cardio sessions per week, recommends Fit Pregnancy. Lower belly fat can be stubborn postpartum. You'll need to target the innermost abdominal muscles called the transverse muscles, according to Julie Tupler, R.N., author of "Maternal Fitness." Plank poses, including both traditional and side plank, are two highly effective deep ab toners. To do plank pose properly, start on your hands and knees and then raise your body up into a flat "plank" position, resting on your palms and toes. Make sure to keep your shoulders directly above your wrists at a-90 degree angle. Start with two sets holding for 30 seconds each. For side plank, roll over from regular plank pose onto your side with your weight on your forearm, stacking your legs on top of each other with one foot resting flat on the other. Do both sides for two sets of 30 seconds each. These seemingly inactive poses deeply engage those transverse muscles needed to tighten a post-baby belly, according to "Fitness" magazine. Yoga and Pilates both have lengthening and toning aspects offering effective postpartum workouts. While they aren't always the calorie burners that intense cardio can be -- though ashtanga and Bikram yoga can shred some serious calories -- many poses in both practices target new mommy problem areas. Effective yoga poses for ab-toning include the warrior series, plank, downward-facing dog, boat pose and tree pose, according to Parenting.com. An added benefit of yoga is that it allows for meditative "me" time, which is very important for new mothers. Pilates on the whole focuses on your core muscles. Pilates workouts strengthen the pelvic floor, the back and abdominals, which are most affected during pregnancy, according to Molly Niles Renshaw, Los Angeles-based Pilates teacher. After the fat burning of cardio and the lengthening and toning of yoga or Pilates, you also need all-over strength building as well. Muscle burns more calories than fat, according to the American Council on Exercise, so you'll want to add a few muscle-building sessions to your week. According to the Fit Healthy Moms website, the four most effective total-body toners for moms are squats, lunges, pushups and pull-ups. Work up to three sets of 10 to 12 reps of squats and lunges, 10 to 20 pushups and six to 12 pull-ups. The great news is that none of them require equipment. Fitness Magazine: How Can I Get Rid of Belly Fat After a Pregnancy? Fitness Magazine: Top Moves to Get Your After-Baby Body, Fast!